Book 2 of Illusional Reality duology. YA romantic fantasy the exciting concluding part of Illusional Reality. Karina is a prolific writer and has had 8 books published in various genres. It was her love of Tolkien and Pullman that Karina wrote her romantic fantasy, Illusional Reality, which has turned out to be her bestseller. Readers have taken Thya and Alkazar into their hearts. When Hati, notices a Tsinian crystal glowing, she knows she must stick to her word and return to her homeland as Thya. Knowing her kinsmen needed her, there was no hesitation. Even though there was more to lose than just her life. Once more a prophesy was given that informed the reader of oracles, that only Thya could stop the war and save not just her people, but the rest of Enumac from Kovon’s psychotic future plans. Along with three other companions, Thya is sent on a perilous quest to locate a dark crystal which holds evil known as the Dark Force. The group are tried and tested throughout their journey by monsters, death and courage. New friendships will be formed and other lost. Thya’s power becomes stronger and a second will threatens to take over her mind body and soul. Will Thya return to Tsinia and for the final showdown with Kovon. Thrillers involving outlaw motorcycle clubs and the highly rated romantic fantasy ILLUSIONAL REALITYShe also writes short stories and when her imagination is working overtime, she writes thought-provoking dark flash fiction.There are many layers to Karina’s writing style and talent. As is displayed in her flash fiction collection, Heads & Takes. And in UNDRESSED she opens up more to her fans. Giving them another glimpse of her warped mind. When Karina isn’t busy working on her next bestseller, she runs affordable indie author services. KKantas AuthorAssist. Social Media Consultant, Book Trailer designer, Narration, Branding and Logo design, Marketing and Promotion Manager, design and VA.
Karina writes in the genres of fantasy, romance, sci-fi, horror, thrillers, and comedy. 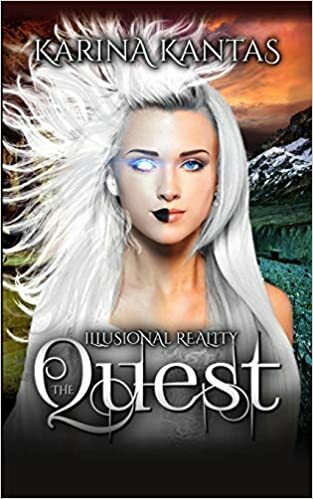 Buy The Quest in paperback and get the eBook of book one of Illusional Reality for free. Please send proof of purchase to receive your free eBook. The Quest in e-book will be released 14th February 2019.